Suggestions & Complaints that regard the forum and website only. For specific games, please relate to their area's below. Discuss our rules and regulations here, campaign for a rule change if you feel it is deserved. This relates to all games. Request forum areas, re-instating of old topics or new features. Report a forum bug here. 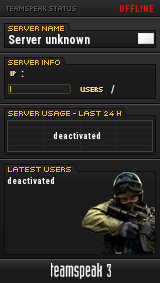 Discuss complaints on CSS/CS:GO Servers here - this relates to bans and behaviour.